Every period in intellectual history has a dominant theme. During the 1930’s and 1940’s, philosophers and political scientists debated the open society and its totalitarian counterparts. The post-war years were heavily influenced by the Cold War. And the 1990’s were all about the so-called End of History: The victory of liberal democracy and the exhaustion of any viable alternative forms of government. What, then, is todays dominant theme? In recent years, a variety of books were published about the challenges liberal democracy is facing. Edward Luce’s The retreat of Western Liberalism. Patrick Deenan’s Why liberalism failed. And Has the West lost it? by Kishore Mahbubani. But I think it is safe to say that none of these books sparked as much debate as Yascha Mounk’s The people vs. democracy. As his analysis shows, one of the greatest achievements of mankind is in danger. Liberal democracy, the political system with majority rule, individual rights and the rule of law as its holy trinity, runs the risk of being dissolved. Professor Mounk is one of the leading voices in the debate on one of the key challenges of our time: How to save democracy. And after reading his outstanding book every one of us has reason to be worried. Not by war. Not by revolutionary uprisings. But by the rise of politicians and political movements that are tearing apart the very concept of liberal democracy itself. During the past decade, we have seen the rise of the ‘illiberal democrat’. Leaders who won elections, who claim to represent a majority of the People, but who – at the same time – have undertaken serious effort to dismantle institutions that are vital to a liberal democracy: A free press. An independent judiciary. And the rule of law itself. The importance of this analyses cannot be stressed enough. According to the independent watch dog Freedom House, democracy and freedom around the world have deteriorated to their lowest point in over a decade. In Europe, the main cause for concern is the rise of right-wing populists who cannot be trusted with political rights and civil liberties. This, ladies and gentlemen, is the political reality we face. History is on the move again. At the end of May, during the European Elections, everywhere there are parties on the ballot who can be characterized as illiberal democrats. From Victor Orbáns national conservatives in Hungary, to Jaroslaw Kaczynski’s Law and Justice Party in Poland. And from Matteo Salvini’s Lega Nord to our very own Party for Freedom and Forum for Democracy. For us, as liberals, these movements are difficult to grasp.And I think that is because they challenge our idea of history. Most of us tend to view the events in the world from a perspective of progress. From the Enlightenment to the French Revolution to Universal Suffrage to Universal Human Rights to Liberal Democracy. History must follow some discernible pattern towards a better world. But the current state of affairs, from the daunting rise of political movements in Europe, to the developments in Turkey, India, China and The United States, poses a problem for this view. It shows us, however inconvenient this may be, that there is no law of progress in history. Instead, as the previous President of the United States once put it, ‘History zig zags.’ It is not written in stone that liberal democracy’s popularity will continue to grow, as it did in the decades after World War Two. Casper Thomas, a Dutch journalist who recently published a book called The Authoritarian Temptation, stated that the rise of illiberal democrats may very well become the political story of the 21st century. In his words, liberal democracy never ‘wins’. At most, it ‘endures’. Ladies and gentlemen, we have reason to worry, but there are grounds for cautious optimism as well. In his work, Professor Mounk gives us a path forward by presenting meaningful reforms that can strengthen our democratic societies and make them more resilient to the dangers of right-wing populists. The lesson we should draw from this, is that we cannot be complacent. We have work to do. And that starts with meaningful debate, the reason why we are here tonight. 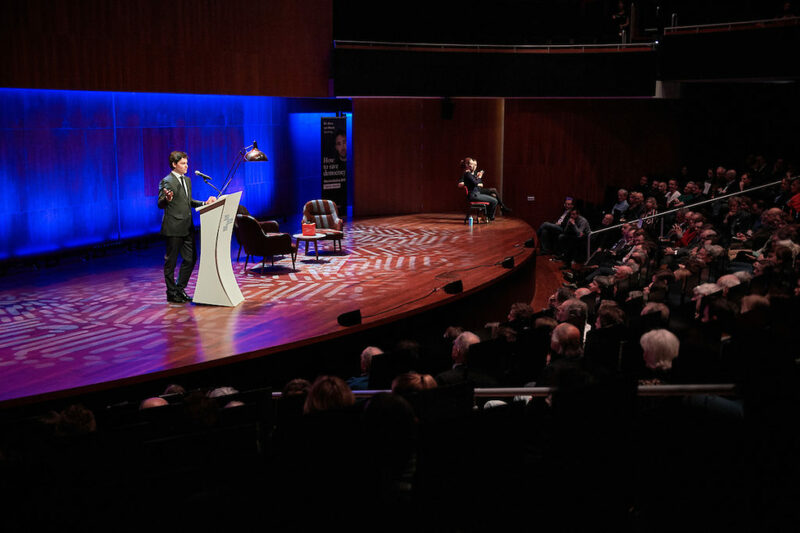 With the Marchant-lectures, de Hans van Mierlo foundation invites experts from abroad to reflect on values that are vital to liberalism. The topic that is central to tonight’s program – How to safe democracy, one of the defining challenges of our time – is perhaps the most urgent topic we have taken on so far. Urgent – for everyone who lives in a democracy. But especially for a party as D66, with ‘democracy’ as its founding principle. And that is why, Professor Mounk, I am delighted to welcome you to this year’s Marchant lecture, to Utrecht, but most of all: to the Netherlands, because as I understood, this is your first lecture here. I am sure I speak for everyone here tonight, when I say we are looking forward to it. I am also very pleased that Professor Tom van der Meer will be responding to the lecture. Professor Van der Meer is one of the most renowned Dutch political scientists. He is not afraid to criticize ‘traditional’ political parties – and mind you, ladies and gentlemen, that includes D66 – for not keeping pace with the evolving preferences of the voters. According to him, there is no crisis of democracy. But there is, in fact, a crisis of political parties. Professor Van der Meer has written a critical review of Professor Mounks work in the past, so I am sure we are in for an interesting evening. Ladies and gentlemen, without further ado, I would like to give the floor to Professor Yascha Mounk.